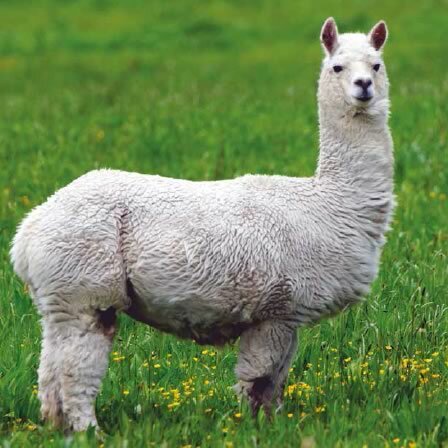 Alpacas look like small Llamas and are adomesticated species from South America. There are no known wild Alpacas as they have been domesticated for thousands of year, first featuring in the wall art of the Moche people of northern Peru. They are too small to use as pack animals and so are exclusively bred for wool and meat. Alpaca wool is highly sought after and has a lustrous, silky texture. Similar to sheep’s wool, but it is warmer and not prickly. Their most common sound is known as ‘humming’, which they do when they are content, curious, worried, bored, fearful, distressed or cautious.